From his artisan confectionery in the San Diego area, Chef Michael iAntonorsi celebrates his love for California sun & surf with these unique and delicious premium chocolate bars. Flavors include Pool Party Pretzel, Bright & Sunny Honey, Sea Salt Surf, Sun Kissed Coconut, and Salted Caramel Dreamin'. Arrives in a signature Chuao gift bag. a perfect gift for your fav chocolate loverl or guilty pleasure for yourself! Gift Measures 6.25" x 7.25" x 3.25"
From his artisan confectionery in the San Diego area, Chef Michael Antonorsi celebrates his love for California sun & surf with these unique and delicious premium chocolate bars. Flavors include Pool Party Pretzel, Bright & Sunny Honey, Sea Salt Surf, Sun Kissed Coconut, and Salted Caramel Dreamin'. 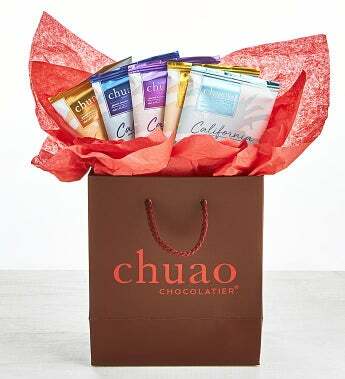 Arrives in a signature Chuao gift bag. a perfect gift for your fav chocolate loverl or guilty pleasure for yourself!